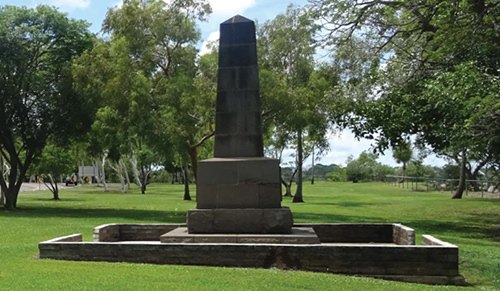 The Northern Territory Government is seeking feedback on the proposed upgrade of the heritage listed Ross Smith Memorial located at the corner of Ross Smith Avenue and East Point Road, Fannie Bay, Darwin. Public consultation closed on 22 June 2017. The Ross Smith Memorial was unveiled on Sunday 20th May 1923 to commemorate the achievement of Captain Ross Smith, Lieutenant Keith Smith and mechanics Sergeants Wally Shiers and Jim Bennett, who in 1919 manned the first aerial flight from England to Australia in under thirty days. The location of the Memorial marks an area in close proximity to the end of the runway at Parap airfield, where the plane would have touched down onto Australian soil. The Memorial is constructed in bluestone in the form of a square obelisk sitting on top of a smooth faced pedestal and a rock-faced stepped base. It is approximately 3.5m in height with a base of approximately 1.8m square. The existing materials used in the surrounds are not original to the memorial and we recommend the replacement of these with a new setting that reflects the landmark status of the memorial within the Ross Smith Park. The new surrounds should be designed in a manner that are in keeping with the materials and design of the memorial and should complement, not compete with the design of the memorial structure itself. Design of the setting should also consider the existing problems with drainage and intrusive tree root systems around the memorial and seek to address any potential issues.